“ Tanager” fell in love with camp as a Voyager camper. She knew there was something special about Cedarbrook Camp in PA from the moment she arrived. Tanager grew up at camp and completed the Camper In Leadership Training (CILT) program. Camp has always had a very special place in her heart. Cedarbrook was where Tanager accepted Christ and really grew to understand what it meant to have a personal relationship with Jesus. This ministry has had the biggest impact on her life. 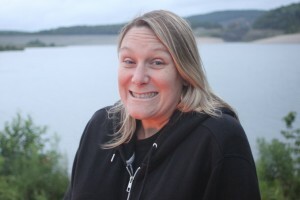 After a few years away from camp, Tanager returned as a counselor, then a division director, eventually girls director and adventure camp director. She is now excited to be the executive director. She can’t wait to see what God is going to do through this ministry and in the lives of the campers and counselors. Cedarbrook staff are all volunteers who love the Lord, love the out-of-doors, and love campers! Many of our staff are parents of campers. Others are campers who have grown up through the program, graduated from CILT and/or attended staff training, and become staff. 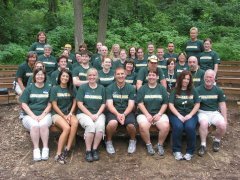 We have a good mix of ages, and most of our staff have been coming back to camp for many years. Staff attend for one or more weeks. In addition, a weekend of training is provided, where staff improve their leadership skills, build relationships with each other, and prepare to lead activities. The staff application process includes background checks and references. Why the bird names for staff? There are many reasons that staff are called by bird names at camp. In the Bible, Elijah (an Old Testament prophet) is fed by God through ravens. In the same way, our staff “feed” our campers through teaching God’s Word, helping them grow, and providing for the daily needs while at camp. It also makes it easier for some of our staff since we span a large age range. Its a fun tradition for Cedarbrook Camp.